Japanese beetle (Popillia japonica), native to northern Japan, was first found near Riverton, New Jersey in 1916. Two years later attempts to eradicate it by the USDA failed. It had become established — the population was too large for attempts to control it to be successful. It is now widespread across North America, reported in all of the contiguous 48 states except for Florida. It is well established from Maine to Minnesota south to Arkansas and Georgia. 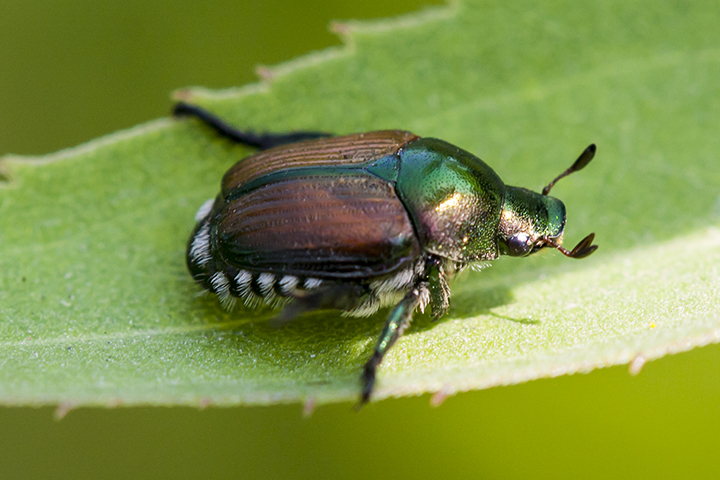 Japanese beetle is a destructive pest in North America where it has no natural enemies. The larvae feed on roots of grass and other plants, causing damage to lawns, parks, golf courses, and pastures. Adults feed on leaves, flowers, and fruits of several hundred species of plants, including fruit trees, ornamental trees, shrubs, vines, field crops, and vegetable crops. They skeletonize leaves by eating the soft tissue but leaving the larger veins. They have caused 50% to 90% defoliation of birch and cottonwood trees in some neighborhoods of the Twin Cities. Japanese beetle is a colorful, medium-sized, scarab beetle. It is identified by a metallic green head and thorax, iridescent. bronze or coppery wing covers, and white tufts of hairs at the sides and end of the abdomen. This entry was posted in Insects and tagged Japanese beetle, Popillia japonica on January 30, 2016 by John Valo. 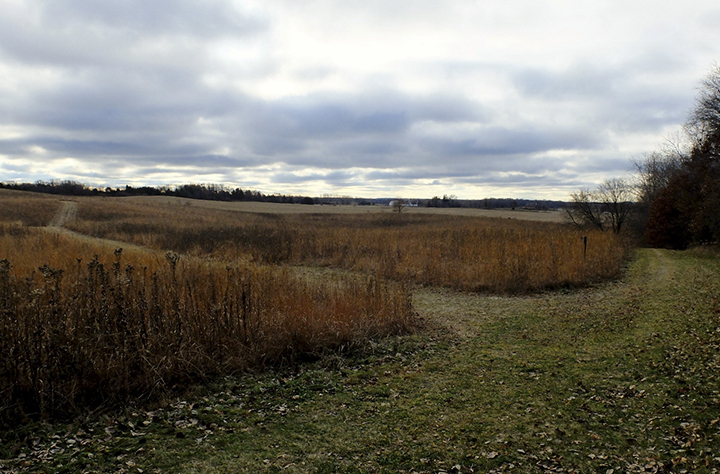 At 340 acres, Ritter Farm Park is by far the largest in the City of Lakeville park system. Its 8.6 miles of hiking/equestrian trails meander around prairie openings and through undeveloped woodlands; across low ridges and into shallow ravines; and through the parks only native plant community, Pin Oak – Bur Oak Woodland. 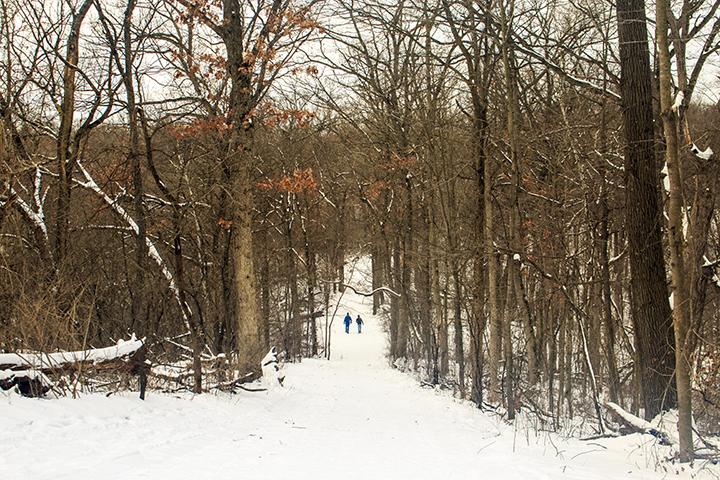 In the winter, 5.7 miles of the trails are groomed for cross-country skiing but are used mostly for winter hiking. 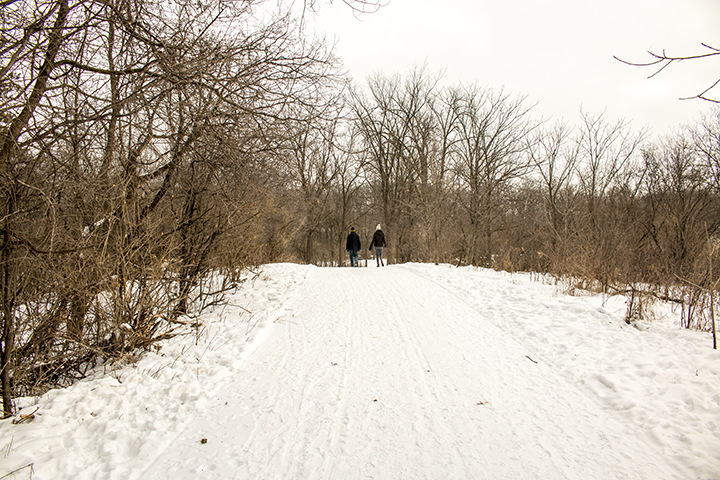 Winter hikers do not have to share the trails with horseback riders. For a park of this size Ritter Farm Park is little visited, even by Lakeville residents. This may be in part due to its out-of-the-way location. It is probably also due to the little exposure it receives on the City of Lakeville’s Website. The Web page for the park consists of a Google map, a link for the trail map and facilities, and a list of rules for horseback rides. Low visitor numbers may be seen as an asset for amateur naturalists or nature lovers looking for a solitary, not social, experience. This entry was posted in Nature Destinations and tagged Ritter Farm Park on January 25, 2016 by John Valo. European bur-reed (Sparganium emersum) is a common plant in northern Minnesota. It is found in shallow water at the margins of lakes and swamps, in ponds and streams, and in backwaters of large rivers. From June to August it produces conspicuous, spherical heads of tiny white flowers. The spongy leaves rising from the base of the plant may be stiff, erect, and up to 32″ long, or limp, floating, and up to 80″ long. The leaf-like bracts on the flowering stem are smaller and spread outwards or bend upwards. There are 22 species of bur-reed worldwide, 9 in North America north of Mexico, 6 in Minnesota. 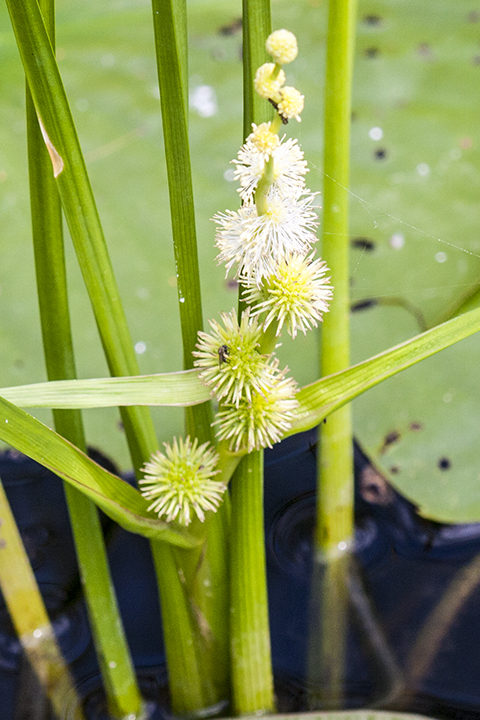 European bur-reed is distinguished by its small size; leaves that are flat, not rounded, on the back; unbranched inflorescence with up to 6 pistillate heads; pistillate flowers with a single stigma; and spindle-shaped fruit that tapers to both ends. When a flowering stem is not present the stiff leaves may be mistaken for narrow-leaved cattail. However, those leaves are rounded on the back, not flat. This entry was posted in Plants and tagged European bur-reed, Sparganium emersum on January 19, 2016 by John Valo. Cypress spurge (Euphorbia cyparissias) is native to Europe and western Asia but not to North America. It was imported, cultivated as an ornamental, and sold in nurseries for use in gardens, parks, and graveyards. It escaped cultivation and is now naturalized across the United States and southern Canada. It is considered invasive and is on the state noxious weed list of 46 states including Wisconsin, but does not show up on any list of invasive or noxious species in Minnesota. The latex exuded by broken stems and leaves of this plant causes a rash in some people similar to that of poison ivy. 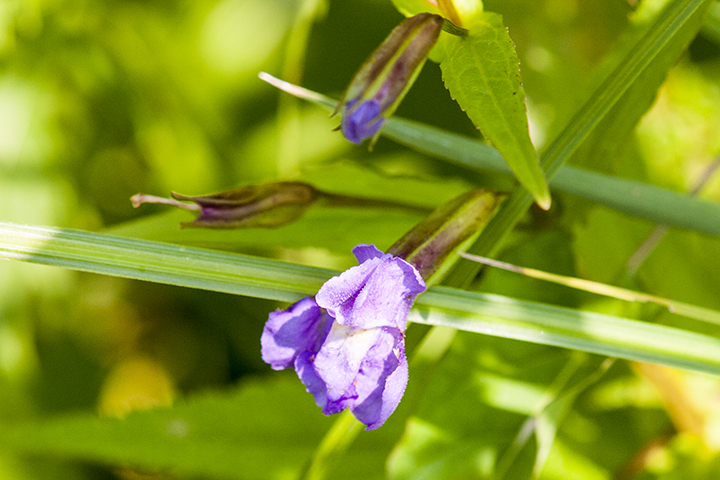 The plant may be also toxic to cattle and horses. Cypress spurge is similar in appearance to another invasive plant, leafy spurge (Euphorbia esula). Cypress spurge is a much smaller plant with smaller, very crowded leaves. 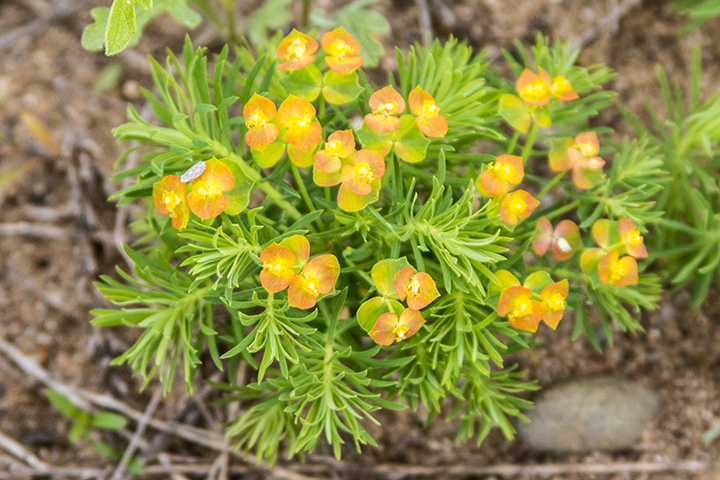 This entry was posted in Plants and tagged Cypress spurge, Euphorbia cyparissias on January 13, 2016 by John Valo. When searching for a location for a nature hike, nature lovers and amateur naturalists may not consider city parks. They are too small, too crowded, over developed, and unless they are nearby, too little known. Sunfish Lake Park should be on the radar for those looking for a nature site in the Twin Cities seven-county metro area. At 284 acres, Sunfish Lake Park is a small park but the largest park in the City of Lake Elmo park system. It is conveniently located just north of Lake Elmo Park Reserve and unlike that park it does not charge a fee. The City of Lake Elmo calls it the “crown jewel of the Lake Elmo park system.” The Minnesota DNR designated it as a regionally significant ecological area (RSEA). The park includes two native plant communities, Oak – (Red Maple) Woodland and Red Oak – Sugar Maple – Basswood – (Bitternut Hickory) Forest. Thirteen bird species designated as of “greatest conservation need” have been seed here, including Acadian Flycatcher and Hooded Warbler, both species of special concern, and Bald Eagle, a tracked species. American ginseng, a plant species of special concern, is also found here. Nine miles of wide mowed trails wind through woodlands, around wetlands, and through a 17-acre prairie restoration. On winter weekends the trails are well used by cross-country skiers, dog walkers, and the occasional amateur naturalist. This entry was posted in Nature Destinations and tagged Sunfish Lake Park on January 5, 2016 by John Valo. 2015 has been a year of growth at MinnesotaSeasons.com. We have had 1,170,684 page views in 2015 generated by 709,481 unique visitors. December was the best month ever with a total of 100,147 page views by 52,760 unique visitors. Over the year contributors have uploaded 306 new photos bringing the total to 694 photos uploaded by 58 contributors. We have added 167 new species and 14 new destinations, bringing the total to 1,332 species and 371 destinations. This entry was posted in Website and tagged 2015, MinnesotaSeasons.com on January 2, 2016 by John Valo.